A lot has been said about the care of the Nickel Cadmium (NiCd) cells we use to power our planes. There’s plenty of advice out there, some of it conflicting. I’m going to go over some of the aspects of NiCd care, compare the alternatives, and tell you what I do with my batteries. I want to start by talking about the most perpetuated myth in NiCd history, namely the so-called "memory effect", supposedly caused by repeatedly using only part of a battery’s charge before recharging it. Memory effect existed in early generation NiCd cells, but it only occurred in situations where each charge and discharge cycle was always exactly the same length as the previous one, such as in a satellite running from its battery and then being recharged by solar power every 90 minutes as it circled Earth. The problem suffered by NiCd cells here on Earth is really "voltage depression", and it is not caused by charging before a full discharge, but rather by excessive overcharging. The reason that partial discharges have been implicated is that without fully discharging, it is not possible to know how long to recharge without overcharging. The charger provided with most consumer electronics (and our R/C radio systems) charge at a constant current, and it is up to the user to disconnect it at the appropriate time (usually 14 hours for a full charge). A recharge after a partial discharge would take less time, depending on how discharged the cells were. Unfortunately, a lot of equipment is left plugged in longer than needed, or even all the time. Figure 1. Discharge curves of a normal NiCd cell (upper curve) and one suffering from voltage depression (lower curve). Notice that the lower curve crosses the cut-off level (imposed by the equipment using the cells) sooner, resulting in an apparent reduction in capacity. Repeated and excessive overcharging does not reduce the cells’ capacity, but it does reduce the average voltage that they provide. A graph of voltage versus elapsed discharge time of a typical NiCd cell looks like the upper curve in Figure 1. The corresponding graph of a cell suffering voltage depression looks like the lower curve. The horizontal line represents the point at which a piece of equipment might stop functioning. You can see that the lower curve crosses this line sooner, so from the equipment user’s point of view, the capacity has decreased. Fortunately, voltage depression is easy to cure. A complete discharge, followed by a complete charge, usually returns the voltage to normal levels. There are basically two ways to charge NiCd cells: slow and fast. Slow charging is usually done at a C/10 rate, which refers to the capacity of the cells (in mAh), divided by 10 (hours). For example, the C/10 rate for 2000mAh cells is 200mA. Theoretically, a full charge at this rate would take 10 hours, but due to charging inefficiencies, it actually takes 14 to 16 hours. Once the cells are fully charged, continued charging produces heat. Fortunately, the rate of heat production is low enough that the cells will not get very warm. As a result, they can tolerate overcharging for a long time (although excessive C/10 overcharging will result in voltage depression). Fast charging can be done at a variety of rates, ranging from about C/2 to 5C (for 2000mAh cells, 1000mA to 10000mA, or 1A to 10A). The important thing to know about fast charging is that the cells will not tolerate overcharging for any significant length of time (only a few seconds at the 5C rate). Fast charging must therefore be done with a charger that stops as soon as a full charge has been reached. One property of NiCd cells is that while being charged, their voltage begins to drop when the cells will accept no more charge. The peak-detecting chargers we use detect this drop, and stop charging at that point. Another side-effect of reaching full charge is that the cell temperature starts to increase. This means that it is possible to detect a full charge by monitoring the temperature of a battery pack as well. 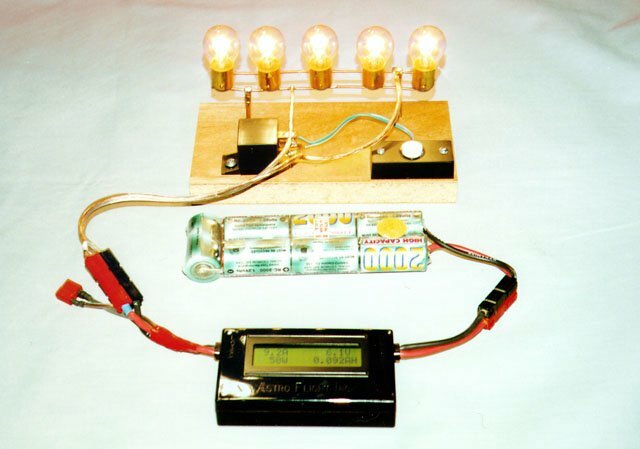 In the early days of electric R/C, before temperature-rise or peak detecting chargers, a simple timer was used. Knowing the capacity and the charge rate, you can estimate the amount of time needed to charge a fully discharged pack. There is a serious problem with this approach. If the pack is not fully discharged, or you make a mistake computing the charge time, then it will reach full charge sooner than expected, and will be overcharged before the timer runs out. At fast charge rates, this results in the destruction of one or more cells due to excessive heat and pressure buildup. To avoid this problem, it was common to discharge the pack, either by running the plane’s motor, or with a dedicated discharger, prior to recharging. An interesting phenomenon is that a recently fast-charged pack is capable of providing higher current, and longer duration, than the same pack that has just been fully slow charged. In low current applications (CD players, R/C systems), this is insignificant, but for electric flight power use, the difference is quite noticeable. Any NiCd can be fast charged, but some can be handle higher rates than others. Cells specifically intended for fast charging (RC2000, RC2400, all SCR and AR cells) can be safely charged at a 5C rate. Cells not intended for fast charge (600AE, 600AA, 1100AAU, etc.) should not be charged at more than a 2C rate. When using a peak or temperature-rise detecting charger, there is no need to discharge a pack before recharging it, regardless of its state of charge. There are however times when it is desirable to discharge: to measure capacity, or when the pack will be stored for an extended period of time. The only way to determine the capacity of a NiCd pack is to discharge it at a known current and compute the capacity, which is the discharge time in hours, times the discharge current in mA. Figure 2 is a schematic diagram of a simple circuit for discharging 6- and 7-cell NiCd packs. The 12V 30A automotive relay K1 is used to connect the pack to a bank of five #1157 automotive bulbs wired in parallel (both filaments). The pack isn’t connected until the relay is turned on by pressing S1 (I used a doorbell button). Current continues to flow through the relay coil through diode D1 once S1 is released, so the relay stays on and the bulbs stay lit. Eventually, the pack voltage drops too low (about 6V) to keep the relay on, so it turns off, the bulbs go out, and discharging stops. By plugging an Astroflight Whattmeter between the pack and the circuit, you can monitor the total number of mAh provided by the pack during the discharge. I assembled my discharger on a piece of wood. The bulbs were all soldered to two heavy solid copper wires, held up on brass tubes. All wiring was done point-to-point. When using the discharger, be careful of the bulbs, since they get very hot. The discharger being used with a Whattmeter to measure the capacity of a 7-cell Sanyo RC2000 NiCd pack. When discharging more than one cell (e.g. a 7-cell pack), it is important not to let the voltage get too low. Consider what happens if one cell has a slightly lower capacity than all the rest. That cell will reach zero volts before all the others. As the others continue to discharge, the lower capacity cell will keeping going down, below zero volts (i.e. it will become reverse charged). This is not good for NiCd cells. By stopping at a high enough voltage, you ensure that this can’t have happened by the time you stop. There are several schools of thoughts on how best to store NiCds. One says to store them charged to prevent the formation of internal short circuits due to crystal growth inside the cells. The idea here is that as soon as such a short circuit forms, current will flow and vaporize the crystal. The other school says to discharge the pack fully before storage. This is based on the fact that NiCd cells tend to self-discharge when left alone, but that the rate of self-discharge varies from one cell to the next. If a pack is left for an extended period of time, some cells will have discharged more than others. If the pack is then recharged at a high rate, some cells will reach full charge before the others, and one of two things will happen. If the peak-detector is sensitive enough, it will detect that one or two cells have peaked, and stop charging before all the cells are fully charged. Worse, if the peak-detector does not detect this situation, it will keep charging until all the cells have peaked, meanwhile overcharging the cells that peaked first. By fully discharging the pack before storage, you guarantee that all the cells are equally discharged when it’s time to recharge the pack. So, what’s the right thing to do? In short, there’s no general agreement. If you store your packs discharged, you can fast charge them at any time. If you store them charged, they might be less prone to internal short circuits, but when you first recharge them after a rest, you’ll need to slow charge them so that you can allow the less-discharged cells to overcharge while the more-discharged ones catch up. If a pack is left unused for a very long time (several months), it’s a good idea to slow charge it the first time you use it regardless of how it was stored. Chemical changes take place within the cells during the long storage period, and make the cells unsuitable for fast charging. Fortunately, these changes can be undone with a slow charge. This is called a "forming charge", and usually needs to be done to brand new cells as well. Attempting to fast-charge a pack of unformed cells will often result in the charger detecting a false peak, because such cells usually show an initial voltage decrease during charging. After a long rest and recharge, a NiCd pack will usually not be able to provide its rated capacity. It often takes two or three charge/discharge cycles before the pack is back in shape. If you don’t mind a few shorter-than-normal flights, the best way to cycle the pack is by flying and recharging at the field. I store most of my packs in the discharged state. When I need to charge one, I’ll fast charge it if it has been sitting around for less than a month, otherwise I’ll either slow charge it, or fast charge it at a very low rate (C/2 or so). Periodically, I will fast charge some of my packs and then immediately discharge them using the circuit shown earlier. I do this to monitor the health of the pack. If the capacity is a lot lower than it used to be, it usually indicates a bad cell in the pack. That was a really usefull article, thank you very much ! Thanks for the well written explanation. I have several NiCad’s that others have changed to HiMh but am not sure if that’s the answer. My NiCad’s do ok, so why change. I need to store one extra I bought. I thought I needed two, but just needed one. Will swap the extra out from time to time. Will always drain it before recharge, the system I use it in does it for me. I will talk to tech support to see what method it uses to determine a full charge. I usually try to cycle them once every three months, but sometimes once every six months. I know that is too long. I use them for work, and it is really slow. Hopefully things will pickup. But in the meantime I need to keep them in top shape. 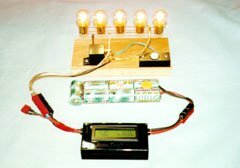 Your article has helped me learn about these batteries. Do you guys happen to remember the old Radio Shack speakers that you hooked your CD player to and where it took 8 C cells for the speakers? Well, the only affordable NIMH battery brand Accupower Evolution has their tops too short, and wont work on my speaker system due to the recessed metal contacts. Tenergy is selling a 3500 MAH Nicad C cell where the tops are long enough. A pack charger and a 8 C cell battery holder will work. The reason why the light seems to dim on the speakers too fast toward the end is because so often the cells are cheap chinese cells sold at a markup, and aren’t matched closely. With a perfect match Nicad, the LED indicator will work accurately, and there is little danger of cell reversal. Just make sure you never leave the power switch on though!! Check what you are buying, and check your contacts!! Especially any boombox using 6 C cells. Maha has the Imedions low self discharge, but I don’t know how well they are matched. Almost $25 for a 2 pack of Cs! Look for the blue jacket on the Nicad cells, and white tops! Got burned again, the yellow bottomed Tenergy Nicads still have their tops too short! !The dark sky blue jacket with the wide top, that is the one you want for they type of problem with recessed contacts! I have been attempting to learn from your articles, as I am an amateur, but now I have a problem – I have bitten off more than I can chew – I attempted to help a young friend with his SUPERPEAK AC/DC 4-8 Cell 4Amp Peak Charger when the on/off switch broke – I had a replacement which I fitted perfectly but in the process I inadvertently dislodged the 3 wires (red, black, white )on the current selector slide where they fit onto the pc board . So now I have a nicely working START switch, but no current selection. Is it at all possible that you could help me find the correct place to solder them back on again. The poor kid is so disappointed now and I feel terrible because his charger now does not work anymore. Dave Staff, Kimberley, South Africa.